Welcome to the celebration of tastes … Welcome to the Kitchen of Annie….!!! 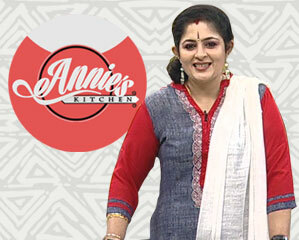 'Annie’s Kitche'n is one of a kind cookery show by actress Annie who prepares variety dishes for Amrita TV viewers, sharing her cooking tips and shortcuts. It is also a kitchen chat coupled with the taste of homely food, and many star guests also come to join her to taste her recipes and share the joy of cooking. Welcome to the colourful world of Annie’s Kitchen. Forget yourselves. It’s not just an opportunity to learn new tastes and dishes. Amidst Annie’s friendly chat, you get to know many celebrities, their tastes and opinions on a wide range of topics, doubling the kitchen to a discussion zone. The first idea that might trigger you is to have a bright kitchen like Annie’s. Even as a child you will have loved acting as a great cook with decorated plates. We had Scientists, politicians, doctors, musicians, film directors, actors and comedians with their family sharing their dreams with Annie and the viewers. Your weekends become lively for an hour from 7 pm with the cheerful host of the programme. We see many promises made and several suggestions come up during the friendly discussions. Our Mayor V K Prashant said that development in Thiruvananthapuram will be his main focus. In a friendly chat with Annie, the Mayor said that there will be an efficient means for waste management. The idea of making terrace farming a must for all and using kitchen waste as manure came up amidst discussion. As Annie pointed out the difficulty faced by women in using e-toilets installed on public spaces, the Mayor promised to consider it and install new ones in women-friendly places. We had former Minister M M Hassan, who while tasting the mutton omlet prepared by Annie, said that if he gets another stint as a Minister, his focus will be on food safety and distribution. Kerala State Higher Education Council Vice-Chairman T P Sreenivasan had suggested to prepare Japanese Prawn Tempura. It was a chance to realise that there are several tasty easy to cook Japanese dishes. He invited our attention to the differences between Asian and continental food. His talk was inspiring as he told us how his parents’ vision helped him become what he is now.